Does MJ support both name and number? If so, how do I set it up to display the name? Also, it says I have to dial my local area code--does anyone else have to do that. And, it doesn't seem to work if I don't run it through my computer--I have a cable modem, but no router; I bought an ethernet splitter--how do I set it up? 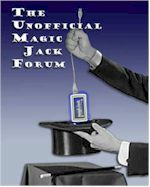 Lastly, I have an answering machine program; do I have to run my Magic Jack (Plus) through my computer in order to have both run? MJ doesn't support CNAME, which gives you the caller's name information along with the telephone number. Maybe it will be supported in the future. 2nd, MJ does require you to dial the area code along with the 7-digit telephone number. Everyone has to do it. The annoyance of this goes away after a few weeks. 3rd, if you have an Ethernet splitter, you should just plug the end with one port to the cable modem and the end with the 2 ports, one for your computer and the other for the MJ+. I would recommend at least buying a wireless router in the future in case you buy a wi-fi enabled device you'd like to setup internet on within your home. It can also provide an extra layer of security for your home network. Lastly, the MJ+ has digital voicemail so there shouldn't be a need for a separate answering machine. You can set it up to have MJ+ send you an email when you receive a new message and you can record personal greetings and busy messages as well as store your voice messages in different folders with the voicemail feature. Hi i would like to point out regarding firefoxsilver9 post is that the Ethernet splitter wont work, if you just plug the splitter directly to your cable modem. the reason is that your cable modem gives out your public IP and plugging in another device via the spliter the modem will not give it another public IP. I dont want to get technical on you but I doubt your ISP provides you with using multiple IP at the SAME TIME. I emphasized on same time because some one might point out that their IP address changed all the time, yes that is what they call dynamic IP address but they dont get to use all those ip addresses at the same time. Ok moving on, I think you will be able to use MJ plus by its own with out a computer if you unplug your computer and plug in your MJ plus in your cable modem ethernet port directly, but i doubt you would want to do that and you would lose internet connection for you computer. So my suggestion is to get a router so that the router will be the one supplying your interneal network with private IP addresses and do the ROUTING to the internet. plus it gives an extra layer of abstraction for hackers wanting to access your computer.